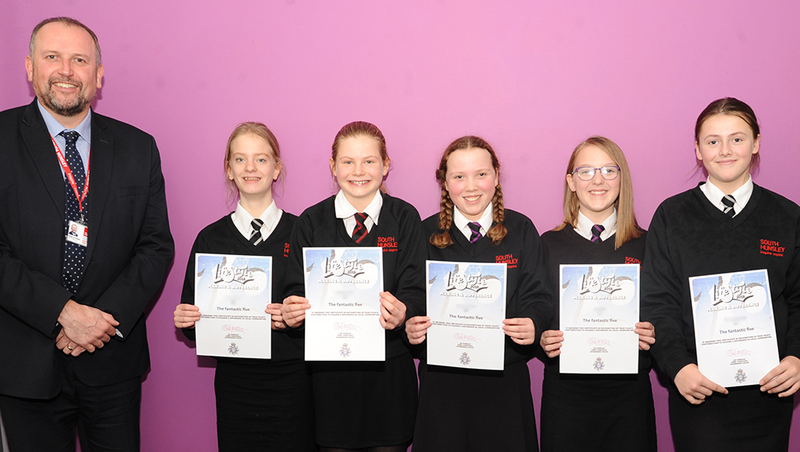 A group of Year 7 students have been recognised for making a difference in the local community. After being inspired by an assembly about the Humberside Police Lifestyle Project, five students came together to form 'The Fantastic Five'. Lifestyle is a youth engagement project which asks young people aged 10-18 to register in teams and spend their summer holidays completing a project to benefit their community. After carefull consideration, The Fantastic Five decided to raise money for Macmillan Cancer Support and collect donations for Hull Animal Welfare. They began planning fundraising activities and hosted a bun sale at Welton Beer Festival during the summer holidays. In total, The Fantastic Five raised £130 for Macmillan Cancer Support and donated £48, as well as items such as towels and dog toys, to Hull Animal Welfare Trust. Since taking part in the Lifestyle Project, students have continued to participate in charity events and Pegasus student, Lana C, recently attended the Pegasus House charity bag pack at Morrisons, to help raise money for Yorkshire Air Ambulance. The Fantastic Five said: "We gained a lot from the experience and learnt to work as a team by sharing responsibilities. It was great to know we were helping others by raising money and donating items to our chosen charities."